It’s tough to motivate Angelenos to do two things: stop texting and start caring about local politics. 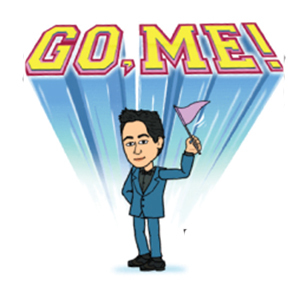 We wondered whether we could help, courtesy of the popular avatar-generating app Bitmoji. Instead of expressing joy, frustration, and victory with all of those generic emoji faces, the custom versions of notable L.A. figures we’ve created can tech-’splain how you feel. Turns out a politician might be a shortcut to saying ciao, or a scientist could convey concern rather than terror. Emojis may not increase our abysmal turnout at the polls, but they would make civic life more animated. L.A.’s first Korean American city council member, Ryu replaced Tom LaBonge in the 4th District (from Sherman Oaks to the Miracle Mile), edging out City Hall veteran Carolyn Ramsay. He positioned himself as the “outsider” with a fresh perspective—and won. Use when: You’re crushing the game and want to brag. Think of Dr. Jones as our collective reality check. The well-known seismologist was brought in to improve our city’s earthquake infrastructure and prep us for the Big One, even when we don’t want to hear it. Use when: You check up on that one friend who’s always a disaster. Before branding was a buzzword, the buxom blond made herself an L.A. icon by plastering her shapely image on a giant billboard with her manager’s phone number listed underneath. Use when: you need someone to understand you’re a big deal. The civic leader and megamogul behind the Grove and the Americana at Brand turned tortuous mall shopping into an upscale open-air experience that draws tourists and natives alike. Use when: you’ve finally landed on a million-dollar idea. Sure, Mr. Mayor looks polished, but we can only imagine how a guy who’s expected to usher in Uber and overhaul our entire economy holds it together until he gets home. Use when: You’re being pulled in every direction and are seriously over it. The affable city council member and local booster recently retired after roughly 40 years in government. He may have officially left office, but we suspect this isn’t the last we’ll see of him. Use when: you don’t want to go, but you have to leave.